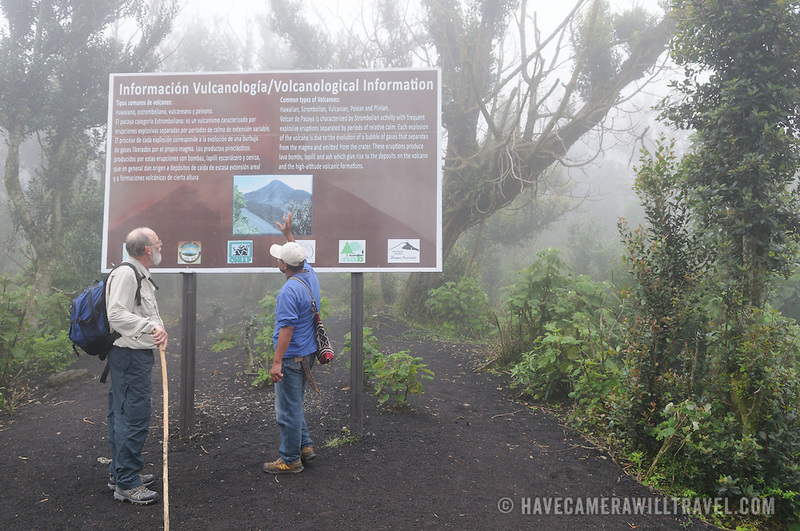 One of the local tour guides provides information to a hiker near the summit of Pacaya Volcano on a misty morning. Pacaya is an active volcano that forms part of the Central America Volcanic Arc. It forms a popular tourist destination easily accessible from Antigua and Guatemala City. Situated within the Pacaya National Park, it rises to 2,552 metres (8,373 ft). Its last major eruption, which caused considerable damange to nearby villages and reshaped the summit, was in May 2010. That eruption and scattered volcanic ash over much of the nearby area, prompting school closings and emergency evacuations and cleared much of the vegetation near the top of the mountain.